Friday night’s arrest of Kayvan Setareh for allowing an 8-story supergraphic ad to be wrapped across three sides of an historic Hollywood building was not the first time the Pacific Palisades man has run afoul of the city’s sign code, according to building department records. In January, 2007, a citation was issued for an illegal supergraphic on the building at 6777 Hollywood Blvd, and In November, 2006, citations were issued for a total of four illegal supergraphics on another building owned by Setareh at 5858 Hollywood Blvd. 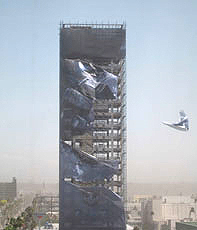 As reported by the L.A. Times, the arrest of Setareh followed concerns that because there was no inspection of the gigantic ad’s attachment to the building it could come loose and cause injury to pedestrians and motorists in the busy street below.